Brent and Jamie are married! They tied the knot at The Palmer Building in Charlotte, North Carolina with friends and family around. It was a beautiful fall day! They shared a first look before the ceremony and had the chance to get pictures with the city skyline in the background. It was perfect! I met Brent back in the fall of 2010 through two mutual friends I had gone to Guatemala with. Throughout the next couple of years, became friends. We had formed a group of about seven people who hung out a lot during the week and did trips and a lot of activities together. Don't laugh at us but we resorted back to middle school called ourselves the "Broskis and Brohos". Through this time, we naturally became better and better friends. Hanging out a lot and I think we both realized we naturally talked to the other one first about what was happening in our lives. We started experiencing life together, going through life’s ups and downs. We both were a little apprehensive to start dating within our small group but I think we finally realized that our friendship was meant for something more. However, I think our friends realized we were supposed to be dating way before we did. When we finally told them we were dating, there were a lot of “About time”, “Called that years ago” and “telling me something I didn’t know”. Even my little sister who only had met Brent once told me that three years ago, she knew we were going to date. We officially dated about a year before he proposed but unofficially probably for a little longer then that! And the proposal! We had planned on going "urban" biking on Saturday, April 2nd (something we liked to do together, just biking through the city). He met me at my place and we casually biked into uptown charlotte. On the way, he said he wanted to bike through all the parks in uptown. Once we came to fourth ward park, he asked to bike by his favorite bench within the park. When he stopped at the bench I was super confused and told him I wasn’t tired yet. He made up some excuse of needing a snack (I actually believed him) and stopped and sat on the bench. Once I was sitting, he pointed to an Easter egg in the garden in front of us and asked me what it was. I proceeded to ask if it was for me and when he nodded his head, I went to open it (apparently I do not pick up on hints very well, even at this point I thought it was a scavenger hunt for my 30th birthday). When I opened up the egg, there was a piece of paper with “Will you marry me?” in the egg. When I turned around, Brent was on one knee and asked me to spend the rest of my life with him. Brent had two of our friends hid in the bushes to take pictures of our special moment. Pretty sure I was in shock for the first 30 mins of being engaged! After finishing calling our parents and friends, we proceeded to brunch and then to a local brewery to celebrate. At the brewery Brent had invited our friends to help celebrate our engagement. Once again, I was surprised and half the party was too as they were told it was a surprise birthday party for me! 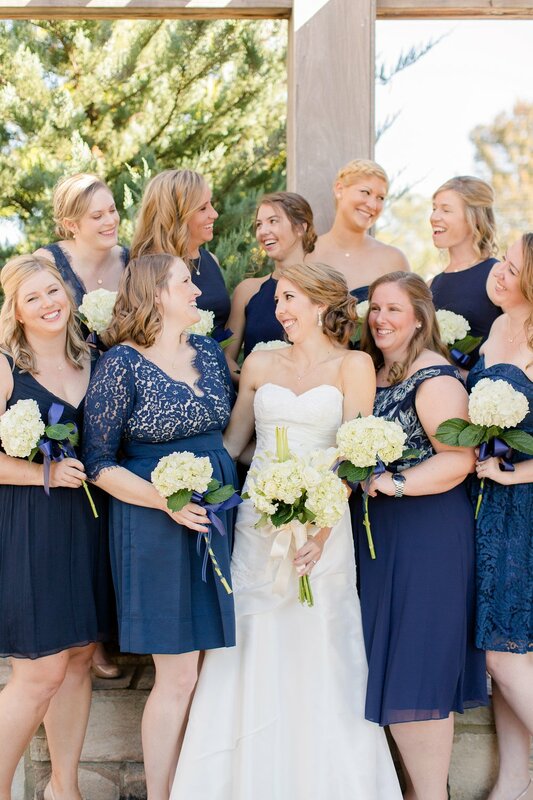 Enjoy these images from Brent & Jamie's wedding! Poor Jamie tripped when she was walking down the stairs. Good thing Brent was there to catch her!! Congrats you two! Hope you had an amazing honeymoon! In case you missed it, check out Nick and Clare's woodsy wedding at Rockland Estates.